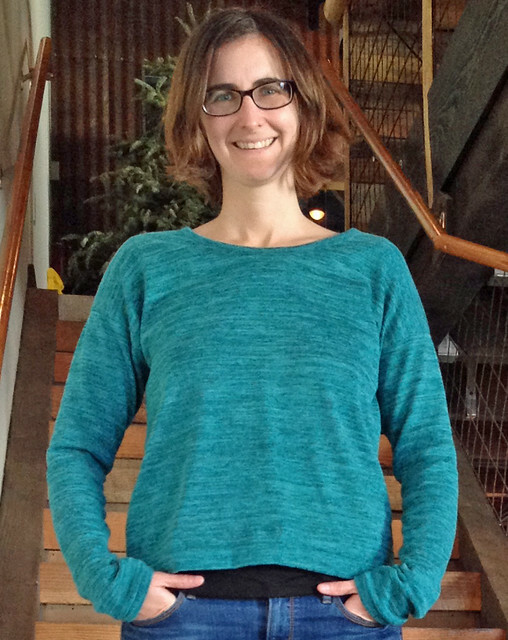 This project started with a perfect teal sweater knit from Stonemountain. I’d already used this fabric in dark and light grey to make two pairs of Hudson pants so I knew it was easy to work with and nice to wear. I noticed that Beth at SunnyGal Studio just posted a sweater she made with this knit too! So if you happen to live the in Bay area you might want to get some of your own. I used a modified version of Grainline’s free Hemlock tee pattern. I’ve used it before to make a few t-shirts, including one that I “skinnied” by removing 2″ of width from the front and back. I also lengthened the sleeves, and used bands to finish the neck and sleeves. The pattern has been shortened by several inches, too. The fabric has a bit of drape and makes for a nice, relaxed and casual fit. A confession: I’ve already bought more of this fabric in a dark grey but I haven’t decided what to do with it. Maybe a Linden sweatshirt? Any suggestions? Great colour! Can’t wait to see what you do with the dark grey. I think I might have to add this pattern to my list. Thank you! It’s a great pattern – lots of fun possibilities, and it’s free – can’t argue with that! Uh oh. A trip to Stonemountain might be in order. Before all of your other fans get there and buy this stuff out! This sweatshirt looks wonderfully comfy and relaxed.